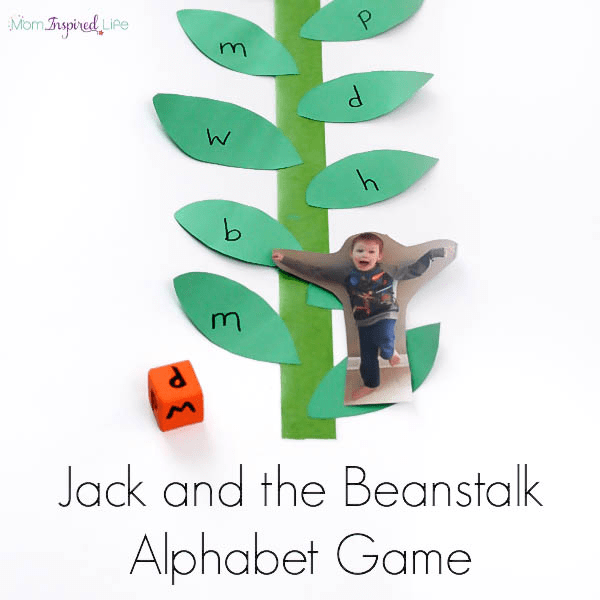 This Jack and the Beanstalk alphabet game is a super fun, fairy tale inspired activity! 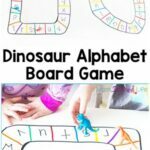 You can even use it to teach kids numbers, shapes and sight words. My son absolutely loves Jack and the Beanstalk. It is probably his favorite fairy tale. 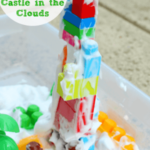 He loved building a castle in the clouds when we did this Jack and the Beanstalk sensory activity. 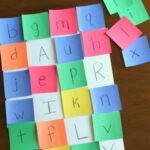 This time I decided to create a fun alphabet game to go with the story. I laid a long piece of green painters tape down the middle of my table with the sticky side facing up. Then I taped the ends down with clear tape and put a rolled up piece under the middle to keep it in place. 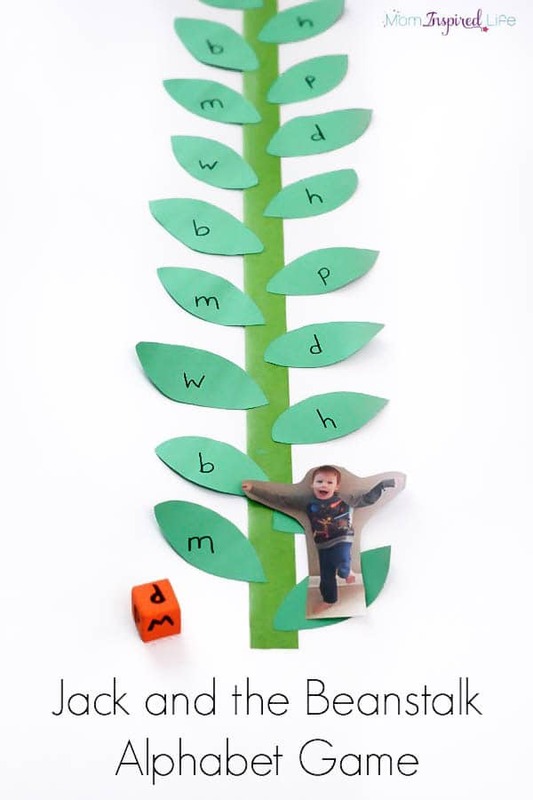 You could also just use long strips of construction paper taped together and to the table….BUT, you will have to tape down each individual leaf to the stalk. Fold 2 or 3 pieces of construction paper in half and then in half again. Draw about 3 leaves on the square facing up. 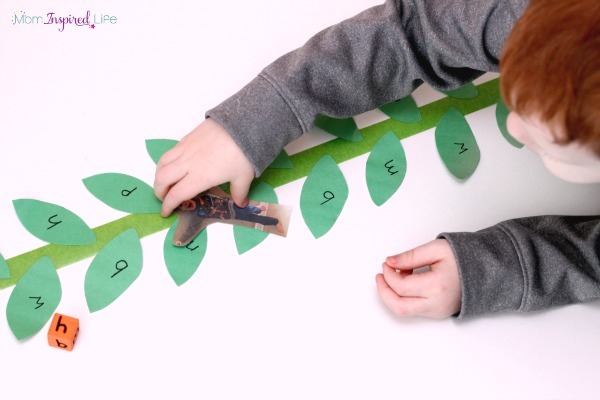 Then cut the leaves out while cutting through all of the folded paper. This will give you a bunch of leaves for your stalk! Stick the leaves to the painter’s tape to make it look like a beanstalk. Or tape them to the paper. 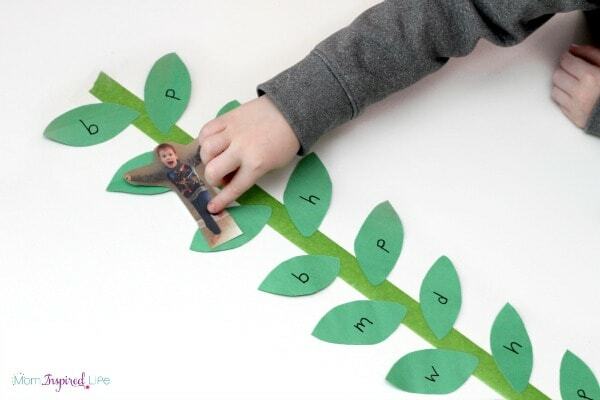 Pick 6 letters you want to reinforce and alternate writing them on the leaves from bottom to top. Take your foam cube and write each letter on one side of the cube with permanent marker. 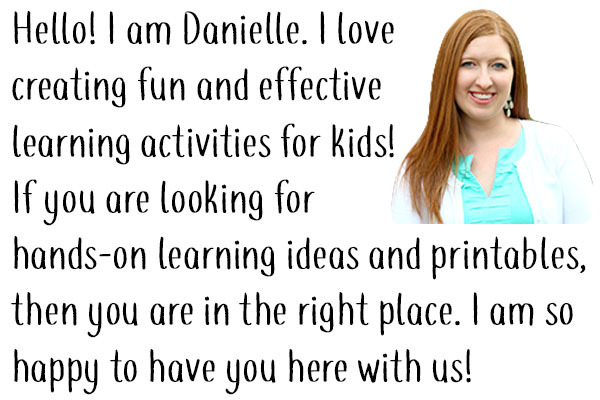 Print out a picture of each child who will be playing the game on cardstock or photo paper. Quality isn’t that important here. Cut their body out from the photo. I took a quick pic of my son pretending to balance on a leaf with my phone, emailed it to myself and then printed it. It was very quick. All players should place their picture at under the beanstalk. 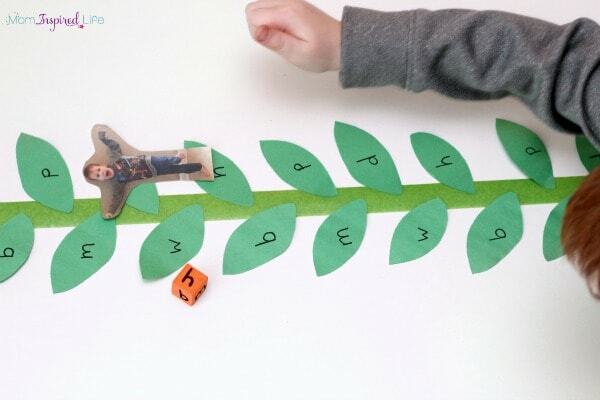 To play the game, each player will take turns rolling the game die and moving their picture to the next instance of that letter on the beanstalk. This continues until each player reaches the top of the beanstalk! 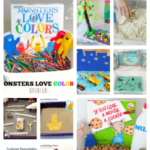 My son thought this was so fun! He got a real kick out of the fact that I printed his picture and he used it as a game piece. He loved how it looked like he was balancing on each leaf he landed on. I think it would be neat to take a pic that looks like each player is climbing the beanstalk. Next time! 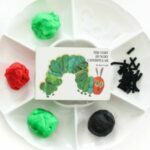 This was such a fun way to integrate letter learning and a classic fairy tale that kids adore! 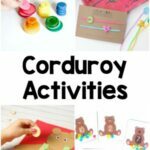 Here are some more fairy tale activities from the ECE Team!